There are so many reasons why New York's picturesque Catskill region should be on your travel itinerary! 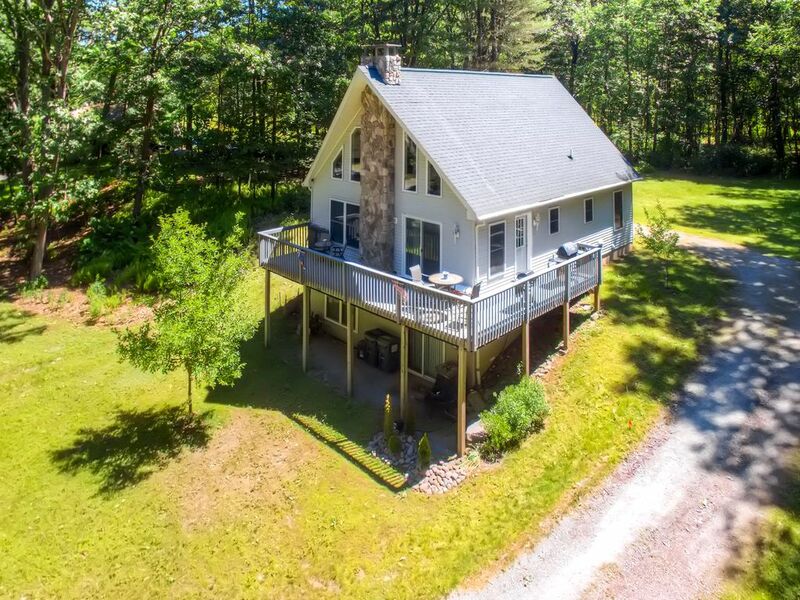 This delightful residence has 2 bedrooms, 1 full bathroom, an open sleeping loft, and enough sleeping accommodations for 6 guests to enjoy upstate New York in style. Boasting a rich history, fantastic outdoor recreation in every season, incredible natural beauty, and short drives to several major urban areas, you'll find that the Catskills provide a refuge from the stresses of everyday life. Elevate your Catskills experience by staying in this charming riverfront chalet! Ideally located on the banks of the Delaware River in Callicoon, this delightful residence has 2 bedrooms, 1 full bathroom, an open sleeping loft, and enough sleeping accommodations for 6 guests, creating the perfect vacation environment for a family or group of couples traveling together. The bright open floor plan is great for entertaining, and the numerous glass windows provide the space with an abundance of natural light, as well as spectacular views of your idyllic surroundings. You'll find both bedrooms and the full bath located on the home's main level, while the upstairs sleeping loft with sitting area overlooks the great room, which features a cozy gas fireplace. All the amenities you need to be as comfortable as possible during your stay are here, including wireless interne access, cable TV, a fully-equipped kitchen, and central air conditioning for when you're not enjoying the Delaware River breezes. Look forward to spending leisurely afternoons lounging outside on the spacious wraparound deck, where you can relax, prepare dinner on the gas grill, and take in the views of the majestic Delaware River. If you're lucky, you might spot an eagle or two soar by! You can also enjoy your gorgeous surroundings and watch for wildlife from the indoor loft viewing area, complete with dry bar, table, and 8 chairs. Outdoors you'll find 200 feet of riverfront property, which is over 800 feet deep to the mountain base behind the house. Bait fish and night crawlers can be caught near the river's edge, so make sure to bring your fishing gear along! When water levels are low enough, there's also a smooth stone beach area for you to enjoy. All the ingredients for an unforgettable Catskills vacation are here! - Incredible location overlooking the majestic Delaware River with 200 feet of riverfront! Summer 2016 Extended Stay Discounts! - $1270/wk for stays of two weeks or more! - $1220/wk for stays of three weeks or more! - $1010/wk for stays of 30 nights or more! The moment we opened the door, the stress level was gone. Perfect, romantic getaway! Scenery was just lovely. we enjoyed the views from the living room and loft, which was a treat! Overall it was very clean. I would recommend this to any couple looking for a romantic getaway. This was a surprise to my girlfriend and she was extremely happy with this getaway! My wife and I thoroughly enjoyed the 4 day getaway at this marvelous and well provisioned home with great views of the river through the large windows and from the beautiful wrap around deck. The house was very clean and well maintain as were the surrounding grounds. The Wifi, TV, and stereo amenities were a nice touch while relaxing in the evenings. The location was perfect for short trips to the surrounding hamlets of Sullivan County. A nice, quiet location that we'll certainly recommend to friends and family. With the river so easily accessible right out front, we'll be back in the warmer months with the kayaks! The place was beautiful but there were ants all over the house: Kitchen, Bedrooms, bathroom and outside there were mounds of ant hill everywhere. There were also spiders inside the house. I am very allergic and I expected there to be bugs outside and came prepared but was surprised of how many bugs we had to kill inside the house. I had to call someone and they had to drop off something to spray around the house which I had to do myself. The loft did not have good air so it was hotter than the rest of the house which made it impossible to sleep in. This is a beautiful cabin if the owners for their next booking can provide the bug spray for the house instead of waiting for it to be an issue that would be better for the next visitors. We enjoyed our week at this comfortable home. The owners have it well stocked with many of the comforts of home right at your fingertips. The only changes I'd make would be to provide access to a washer and dryer, particularly since there are no such facilities anywhere near by. Also - and is was a big one for me - I'd get rid of all the notes everywhere. While I appreciate that the owner is trying to be helpful, when you're renting a house you want it to feel like home while you're there. And having notes everywhere, including one to tell you not to stand on the toilet, has the opposite affect. Take all of those notes and put them in a tabbed binder on the counter. If people need help with something, they can refer to that. Else, they can enjoy their stay without feeling chastised or unwelcome. All in all, nice place and quite peaceful. We had a good time with friends and our kids. Beautiful nature, comfortable, clean and cozy house brought us a good impression of the stay. thank you!